Designed by Takeo Shiota and opened in 1915, Brooklyn Botanic Garden’s Japanese Hill-and-Pond Garden combines elements of several different traditional garden styles. One of these, the tea garden, or roji, is intended to prepare guests for a tea ceremony. Such rituals, called chanoyu, were popular in Japan in the 16th and 17th centuries. 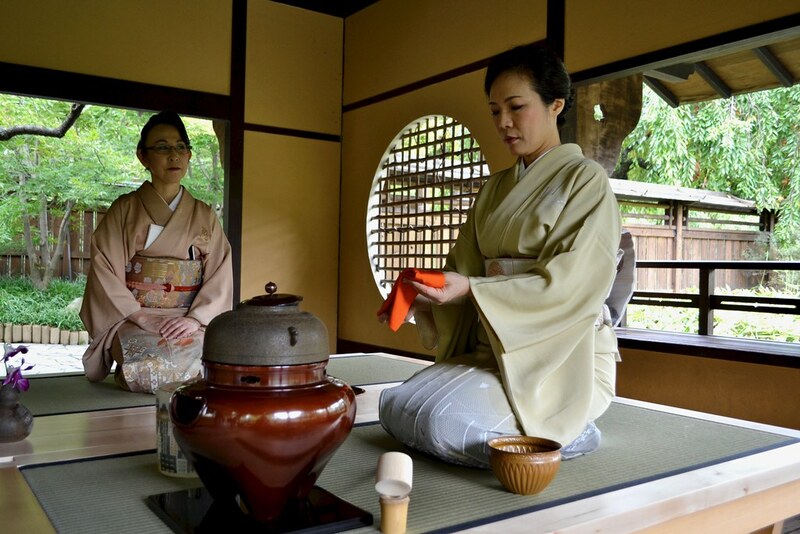 Guests would gather to drink specially prepared tea in rustic teahouses within simple gardens designed to allow people to connect with nature as they passed through. BBG’s Japanese garden is not a strict interpretation of a roji, but it includes several quintessential elements. Its wooden viewing pavilion is built in the style of a teahouse, and the roofed bench along the path is modeled after the waiting benches placed in tea gardens, where guests would await the ceremony. Recently a tatami platform was built to allow people to experience such ceremonies in the pavilion. Registered guests will have several opportunities to participate in tea ceremonies here, to be held October 11 and 19 and again in the spring. Advance registration is required. A Japanese tea ceremony demonstration led by tea master Keiko Kitazawa-Koch on BBG's new portable tatami platform. The platform was commissioned by Stephen Globus and made especially for BBG by renowned Japanese carpentry shop Miya Shoji.